Caenorhabditis elegans has become a powerful experimental organism with which to study meiotic processes that promote the accurate segregation of chromosomes during the generation of haploid gametes. Haploid reproductive cells are produced through one round of chromosome replication followed by two ­successive cell divisions. Characteristic meiotic chromosome structure and dynamics are largely conserved in C. elegans. Chromosomes adopt a meiosis-specific structure by loading cohesin proteins, assembling axial elements, and acquiring chromatin marks. Homologous chromosomes pair and form physical connections though synapsis and recombination. Synaptonemal complex and crossover formation allow for the homologs to stably associate prior to remodeling that facilitates their segregation. 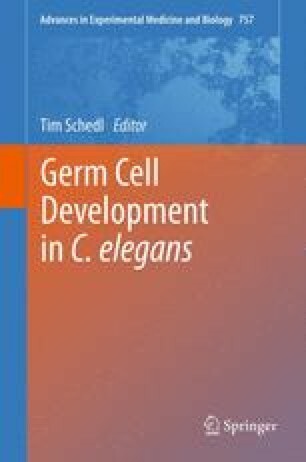 This chapter will cover conserved meiotic processes as well as highlight aspects of meiosis that are unique to C. elegans. We thank Dr. Anne Villeneuve and members of the Colaiácovo lab for early access to unpublished results. We also thank Tim Schedl, Sara Beese-Sims, Takamune Saito, and Patrick Allard for critical reading of this manuscript. This work was supported by National Institutes of Health Grant R01GM072551 (to M.P.C. ).